It had taken some time to shift of my own accord. It didn’t help that I was surrounded by other AniMages, impatiently waiting for me to force something they could do with a thought. It was only as I got more angry at myself that the beast finally made his presence known and I was able to let him take over. Because I would have no idea what was happening, I had to trust Elias when he said the group would be able to keep me with them. It could have been minutes or hours that we ran, but we I woke up, Elias and Dillon were standing with their backs to me and we were alone in a patch of trees. “Are we there?” My voice was raspy and my thoughts muddled. It always took me a few minutes to disengage and become myself again. “Now, Dillon, don’t be rude. What would your mother think?” Elias scolded Dillon and his ashamed expression made me feel guilty. “It’s okay, Dillon. I appreciate you watching out for me while I figure all of this out. Has your owl told you anything else about me while we were out tonight?” I got dressed with the clothes Elias tossed my way as Dillon scrunched his face, thinking. That perked my interest but I tried to stay cool. I nodded and fell in step with Elias, my thoughts a whirlwind in my head. I had always been drawn to Amelia, I could recognize that, but I could separate that from her. It had been nagging at my mind that all of my attraction could be a product of this prophecy, but when I thought of her I didn’t think of her as drawing me in against my will. I thought of her laugh. I thought of the way she hid so much of herself until she knew you and trusted you. I remembered all those days I spent pursuing her, working to build that trust and climbing over her walls. The vision of her laughing that day in the parking lot when she accused me of being a stalker, but her smile gave away the fact that she looked forward to seeing me just as much as I did her. Fate may have brought us together but we could have pushed against it and we didn’t. We had something. 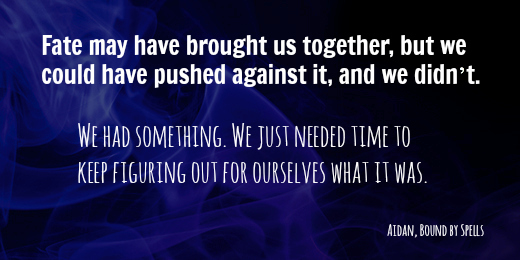 We just needed time to keep figuring out for ourselves what it was. I hope you had fun inside Aidan’s head. Stay tuned, I’ll have the synopsis for you soon, and you’ll be glad to know that I have officially finished the first draft. Now, it’s on to making her shine! To find out when my next book releases, sign up here! I participate in the Amazon Services LLC Associates Program, an affiliate advertising program designed to provide a means for sites to earn advertising fees linking to amazon.com.